You've heard of "Dancing with the Stars." 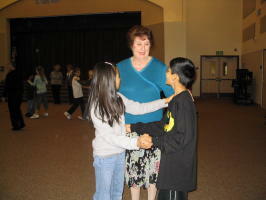 District learn ballroom dancing each year. The class is offered as a unit of 5th grade Physical Education. Each fifth grade class gets four half-hour sessions. waltz, rumba, swing, and merengue. The children learn quickly, and once they get over their initial shyness, they enjoy it and have a good time. 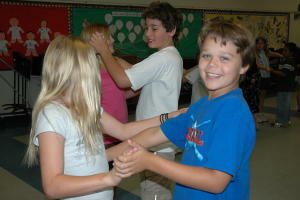 We change partners frequently, so they get to dance with many different partners in their class. We use contemporary music to make it relevant for them. The classroom teachers often join in, and sometimes the principal, the custodian, the office staff, and whatever parents are there. The teachers appreciate the social skills the children gain. Twenty SHOK volunteers take part in the ballroom program. They divide into teams of 6 or 7 for each class, allowing for lots of individual attention. The volunteers love working with the children and look forward to each new school. SHOKprogram.org is the official website of the SHOK Program. This site is hosted by George Cooke as a community service. For aerial photos of Rancho Bernardo and the areas served by SHOK please visit http://RBpicture.com.